Ground Handling International is sent to 8,600 key industry decision-makers who are specifically involved in delivering ground handling operations and related services. Ground Handling International is read by professionals in over 200 countries worldwide. 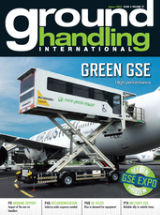 Ground Handling International has a long standing reputation for editorial excellence and is the leading magazine for the latest in passenger, ramp and cargo handling. Why ABC? Ground Handling International is an independently audited magazine, audited by ABC (the Audit Bureau of Circulation) who guarantee the circulation we promise. Advertisers need to be sure they are getting the best possible reach for their valuable budget. GHI delivers this, and our ABC audit confirms our readers are who we say they are. With a circulation of 8,600 copies and a pass on readership estimated at 4 people per copy, GHI can deliver a readership of over 34,000! In addition, another 4,000 copies of GHI are distributed at global industry events throughout the year.